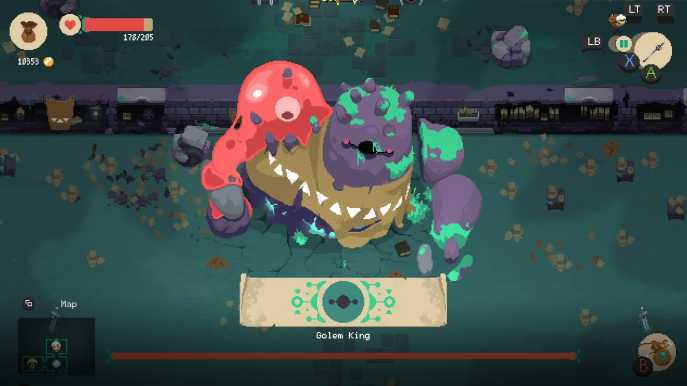 Moonlighter is a strange game. By about seven hours with it I had decided it was okay, not a game I was particularly enjoying but satisfactory nonetheless. Then, after unlocking the final couple of dungeons, I started enjoying it a lot more. The constant supply of loot and the loop of dungeoning and selling your finds is a great motivation to continue the grind. 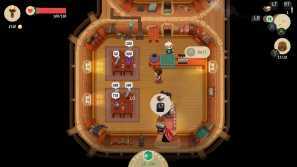 You play as Will, running a merchants in a small town. There are four dungeons nearby that have been sealed for many years. One opens, and Will is determined to find the secret. The rumour is that a guardian in each holds a key. All four keys would unlock the mysterious door placed just behind the dungeon entrances. Will also needs something to sell. Luckily, monsters in the dungeons hold a considerable amount of loot. Plenty enough to make a great profit from. 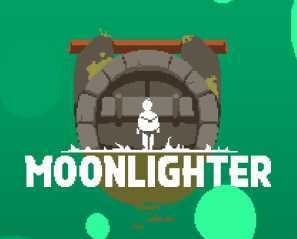 There is quite a narrow gameplay loop in Moonlighter, and you will find yourself repeating countless times. 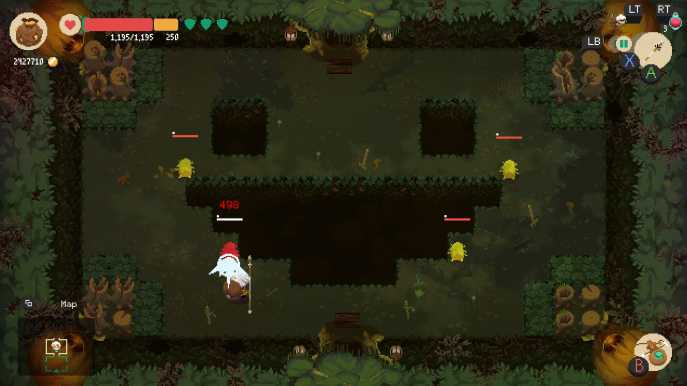 You go into the dungeon and fight enemies to get loot. Once your bag is full (it can hold twenty unique items and can never be upgraded, argh!) you can teleport back to the town at a small cost. This also ends your progress in the dungeon. Then, at your shop, you can sell the items. Owning the shop is the best part of the game. You can choose any price for the item you desire but you have to determine the correct cost based on customer's reactions. There are four: under-priced, the perfect price, a bit pricey but still purchasable and too expensive. Selling something at a higher price than the customer desires can send the item into low demand, but this is mainly superficial. It has no real effect on the game once you are selling items at the correct price smoothly. To assist with this, you can edit the price on the fly, giving you things to do while you have the shop open. Once the working hours are over, you can go to bed or return to the dungeon for more supplies. There are a good quantity of unique items in the game, so you don't feel like your selling the same things over and over. There is a wide array of things you can spend your well-earned money on throughout the game. 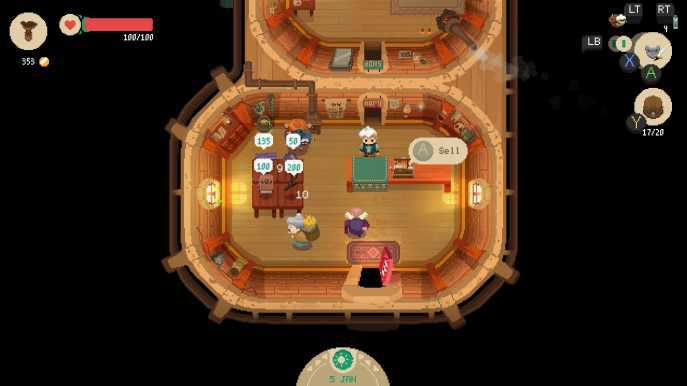 These consist of: upgrades to your shop, investing in other local businesses, potions, new weapons and armour as well as upgrading your current set and trinkets to display in your shop. These have positive effects on customers. For example: by the end, I had several in the shop all with a 'generous tip' boon. Customers were paying 200% of the listed cost. The weakest part of the game are the dungeons themselves. Despite being procedurally generated, it feels the same every time. The fighting system is very basic. Two attacks per weapon; a standard hit and a charge attack. I stuck with a spear the entire game, mainly because of the range (you can hide behind a rock and hit an enemy on the other side, even though their attacks are blocked by said rock). Your attack does the same amount of damage in every hit (or double if you get a critical hit). The simplistic fighting and predictability of your damage is plain boring. There really needed to be some flourish here. This was the main problem I had; the tedium of grinding in the dungeons. It became a bit much at times and I felt like I needed some time away from the game before doing again. This is the main gameplay loop. You grind in the dungeons to get the loot and then sell it all. This is repeated until you have enough money/resources to upgrade your equipment. Once you've upgraded everything you can then breeze through the dungeon as you're completely overpowered, killing most enemies in a single hit. This is then repeated three more times until you finish the game. The additional components to the game are somewhat hit-and-miss. There is a wish-listing system at the blacksmith's – you need to gather certain amounts of loot as well as paying money to upgrade your equipment – and this puts a star over the item. This is very helpful in ensuring you don't accidentally sell the items that you need. One thing that annoyed me, and this is likely me being stupid: I got to the fourth dungeon with 245 health and decided I really needed to upgrade my armour. I went back to the previous dungeons to grind and get the items I needed to build up the sets (to build a later item you need to already own the previous upgrade). It took ages to get the specific items, and some of them I didn't get at all. What I didn't realise is that you can just buy any item in the game from another shop in the town. I did that, upgraded all my equipment and suddenly found myself with 1195 health. The end game became much easier! The UI deserves a mention. It is fantastic. You can move your loot across chests and bags with a single button or in a more thorough method if that is your preference. The different stats all show when you need them and it all feels very intuitive. Again, the wish-listing system prevents an awful lot of potential frustration. There are side missions which I largely ignored. They are 'bring this many of this item within two days'. I only completed one and that was only because I just happened to have the items they were after. By the time these missions start in the game you are making enough money not to bother with them. Shoplifters are an absolute pain. As is your shop assistant. Shoplifters have the symbol above their head as they enter the shop (and its the same select characters every single time). They wander about for a while then pick up something. You need to roll into them to retrieve the item and they exit the shop (for about a minute before coming back in and doing it again). They are easy enough to catch. The part that makes it harder is the shop assistant. You don't have a choice in her being there and her character model is solid, unlike everyone else. It means that if she is standing in an isle, or at the entrance to the till, you cannot get past her. She stopped me from catching shoplifters several times just because she was blocking me. It was very frustrating. The game is buggy as well. I've had the game crash several times and various things causing it not to save, meaning I'd have to repeat a day. I had an item that couldn't sell for any money, a customer get stuck in an animation and wouldn't leave after the shop was closed (again, the game wouldn't save after this happened), customers in the queue not moving up so you cannot sell anything and they stand there until the end of time. It is quite disruptive, especially when you feel like you are making real progress. This game survives on its constant range of upgrades and the often smooth operation of shop-running. There is always something to aim for, to improve or to expand and in this way it doesn't get boring. There are relatively few games where you own a shop, and this is one of the better titles. The colourful visuals, great animation and suitable soundtrack are enjoyable throughout. Despite my reservations of the game's numerous shortcomings, it was a good time and a fun interesting. As a note, the conclusion of the game is utterly bizarre and completely out of line with the rest of the game. It's amusing and cute though. A PC copy was provided to Gamerscape for the purpose of review. + The shop-running is interesting and fun throughout. + Constant supply of upgrades and things to aim for. + Great visuals, use of colour, music and UI. 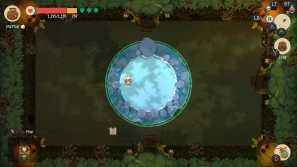 - Numerous bugs hamper gameplay. - Simplistic and uninteresting fighting mechanics. - Can feel very repetitive.